Melted down hardware captured from the Germans in World War Two will be used to form the main steps of a planned cathedral in Russia, according to a senior member of the President Vladimir Putin’s administration. 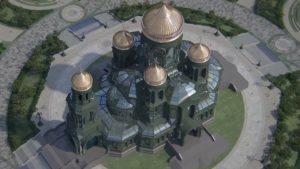 The 300-foot high glass and metal Main Cathedral of the Armed Forces, to tower above Patriot Park 40 miles west of Moscow and which will seat 6,000 people and cover 117,865 square feet, will “symbolize the spirituality of the Russian Army raising the sword only to protect its Motherland,” a website set up to promote the project stated. Construction on the huge structure, a foot higher than the Statue of Liberty, has begun, and it is anticipated the cost will be covered by public donations. The defense ministry recently said that 1.8 billion rubles ($27 million) has been raised. 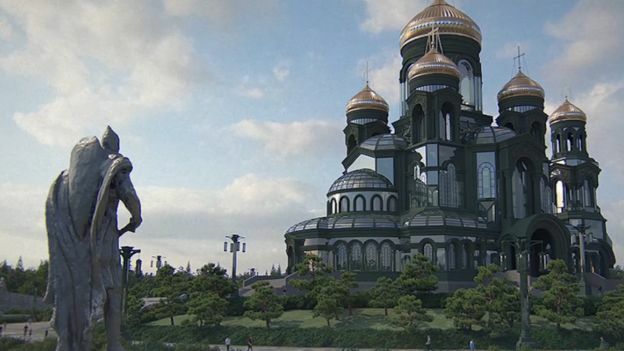 Its grounds will be decorated with statues of Christian figures, including the Prophet Elijah and the medieval Prince Alexander Nevsky, regarded as a saint in Russia.